I'm not sure how many old European magic spells were ever written down, but prominent among the survivors are a couple for controlling our one of our few domesticated insects, the honey bee. I think it's possible that there are people today who don't really know what a bee swarm is, or why it matters. Swarming is how a honeybee colony reproduces. It's a special event during which the queen, rather unusually, lays fertile female eggs which will develop into new queens. Having done so, she will abandon the old colony herself, taking more than half her workers with her, but leaving her daughter with an established infrastructure. For bee-keepers, uncontrolled swarming is a thing to be avoided at all costs. Bees left to their own devices will leave them with a reduced hive of unproductive bees struggling to re-establish itself and the loss of more than half their 'livestock' into the wilds.There are few things more beautiful than a wild honeybee hive (see left), but try telling that to bee-keepers and said hive's human neighbours! I suppose it's true that if you do a Google image search for bee swam pictures, swarms do seem to get into some rather anti-social places. Our ancestors were obviously more than willing to resort to begging, threatening and pleading to prevent this. I find the Old English of this spell so beautiful, I had to do my own translation to capture the rhythm of the exhortation. There are more linguistically accurate translations here and here. The Lorsch Bee Blessing is formatted more like a prayer or invocation, but it was meant for the same purpose. It sounds a lot more fraught to modern ears. Uuirki godes uuillon Christ, the bee swarm is out here! Now fly, you my animals, come. come home in good health. The command to you from the Holy Mary. Neither should you slip away from me. 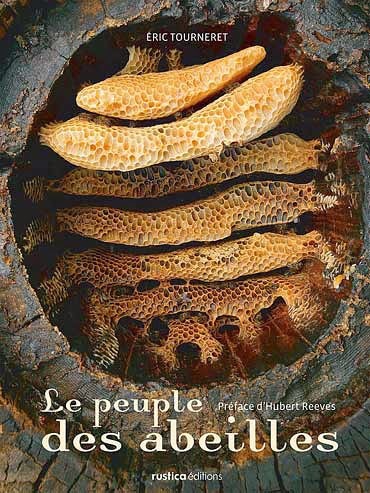 Unfortunately, it was eventually discovered that honey bees are largely impervious to human poetics.The way to deal with swarming bees is, as usual, by knowing stuff. Traditional Hives via Wikimedia Commons. What the swarm is looking for a new hive. You could have the best new hiving spot in the district all ready for them and hope they pick it, but that's kind of primitive. To be really modern, you would sprinkle alluring bee pheromone all over it. You can physically capture the swarm and get them into your new hive. There are lots of ways of doing this, from the primitive to the high-tech, provided you know them. You can clip the queen's wings to prevent her flying, making sure the attempted swarm never gets far from the original hive. This is the only method which is actually considered desirable, as a stop-gap measure. This relies on knowing why bees do what they do. If a colony has grown past a certain population density, has plentiful supplies of food and future bees, and a sufficiently mature queen, it will quite likely prepare to swarm. Bees want to swarm. It's how they reproduce. But if you can trick them into thinking population density is low, and resources uncertain, they may defer reproduction until times look better. Alternatively, you can use 'controlled swarming' techniques, such as permanently or temporarily splitting the colony, or creating a mini-colony around the old queen - a kind of mini-swarm. Some techniques rely explicitly on making the bees think they have swarmed when in fact, they've returned to their old hive. Deciding what to do with the cells containing new queens is a secondary issue - their fate will no longer have an impact on a colony's decision to swarm. That's the basic theory and the reason the practice is complicated is that there are several ways of doing all of these things, but the response of the bees is variable and no method is absolutely reliable. Or perhaps we still don't know enough stuff.